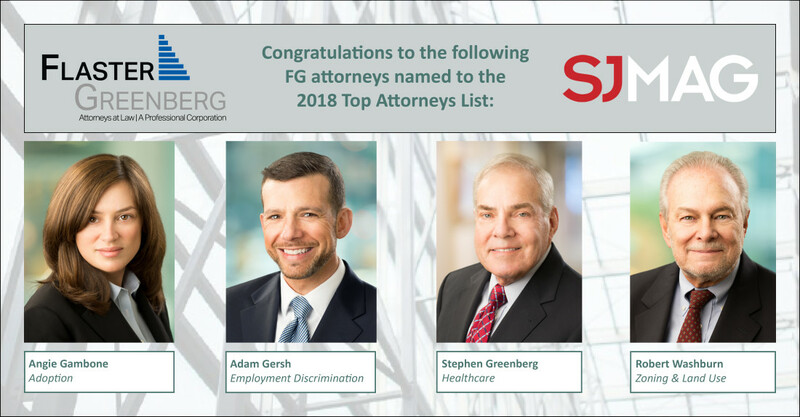 Four Flaster Greenberg attorneys were chosen by SJ Magazine to appear in the 2018 Top Attorneys list. These attorneys were nominated by their peers as professionals at the top of their respective fields that are committed to upholding and fighting for the law. Congratulations to Angie Gambone for her nomination in the Adoption Category; Adam Gersh for his nomination in the Employment Discrimination category; Stephen Greenberg for his nomination in the Healthcare category; and Robert Washburn for his nomination in the Zoning & Land Use category. Click here to read the full list of honorees.